Maybe there were plenty of boxes you did check: Family Home Evening, family prayer, family scripture reading, family dinner around the table every night. Logically you knew those were not guarantees of a certain outcome. But in your heart you still expected that outcome as a reward for following the rules. -Each priesthood office achieved worthily and on schedule. All are indeed worthy goals. But if they are our goals for someone else (insert your child’s name here), then there are points all along the way when the plan can spin out of your control. A few 8-year-olds opt out of baptism. Even more teenagers balk at Priesthood advancement or Seminary. The numbers of defectors grow with age, independence and the difficulty of the goal. Sadly we set ourselves up for disappointment as parents when we treat those achievements as plateaus — safe places from which there will be no backsliding. The importance of the achievement becomes a false sense of security for the parents of those who make it. For the parents of those who don’t, or those who reach the plateau and retreat, the check list becomes a source of agony. It is this second group that I address here. What other church has such a check list? When was the last time you heard a Lutheran friend bemoan the fact that his son married an Episcopalian, and thus all is lost? Or a Catholic friend lose sleep over the fact that her child chose a state university? What Baptist mother cries herself to sleep at night because her son is not a full-time missionary? Our church sets a stratospheric standard of performance and covenant-making for reasons that I accept without reservation and will not belabor here. But I will help you find common ground with other parents who struggle with unmet expectations. I know plenty of them. If you don’t, then you probably need to get out more. First, put things in perspective. In the grand scheme of things, it will not be a tragedy that your son had to choose between Eagle Scout and Duty to God because he was too busy being student body president and captain of the basketball team. When other mothers’ sons are paraded before you at the Eagle Court of Honor and your son is not among them, get over it. He’s only 18 with three fourths of his life still ahead of him. The stakes may seem higher when your son opts out of serving a mission and instead serves his country in the military. It wasn’t your choice, but it was an honorable one. Take comfort in the fact that many future apostles did the same when duty called. And if the choice is “none of the above” — no mission, no military, no college, no discernible plan — realize that your child may just need more time to decide what he wants to be when he grows up. Continue nurturing the best in him. If your child’s choices go from “good-better-best” to “bad-worse-worst,” remember that the Savior of the world can and will handle this. Either you trust Him or you don’t. Trusting Him helps you sleep better, and that may be the only choice you have. In the meantime, be prepared to hold your head up when others make you feel like you must have done something wrong. I like to think of those naysayers as the parents for whom the other shoe has not dropped, yet. Second, have a good cry and then move on. My friend Donna and I have sons the same age who grew up together and checked the boxes together. But when their peers chose missions, our sons did not. The day that two of their best friends shared a Sacrament Meeting program to give their “farewell” talks, Donna and I smiled and shared the joy. But after the meeting we saw each other in the foyer, both with tears in our eyes. “Let’s get out of here,” I said. We walked across the street to my house to drown our sorrows in chocolate and Dr. Pepper. Yes, we skipped Sunday School, but we got back in time for Relief Society (since Donna was the president.) A brief cry with a friend can be very therapeutic, when paired with junk food. But, take care not to wallow in any of those therapies for too long. Third, recognize and rejoice in the good in your children. At lunch with a friend, I listened as she poured out her concerns about an adult daughter who was not following the plan with exactness. The daughter — I’ll call her Liz — finds sympathy with the concerns of Mormon feminists, and, horror of horrors, even wears pants to church. Liz serves in the Primary and consistently plans programs there that help little girls realize their potential. When “Friends of Scouting” comes calling for donations, Liz declines and instead earmarks a generous amount on her donation slip for Girls Camp. Liz owns her own business and is PTA president, and still manages to spend plenty of time with her own children. “But they don’t do Family Home Evening!” my friend moaned. One box without a check, but so many things for a grandmother to rejoice about, if only she would see them for what they are. Fourth, make a modest list of desirable outcomes you would hope for your children, including some things they may have already accomplished. -Marriage to an honorable partner who shares your child’s values. -Achievement in a career path. It’s a list that 99.9 percent of the world’s parents would embrace. You’re not giving up on revealed truth if you embrace it, too. Just because you’re the fraction of a percent for whom this list is not quite up to snuff, don’t lose sight of the beauty that is there. Remember that you cannot make your child be or do anything. You can only change yourself. But if something on your modest list comes to fruition, you will recognize it as good instead of grieving because your child has fallen short of perfection. 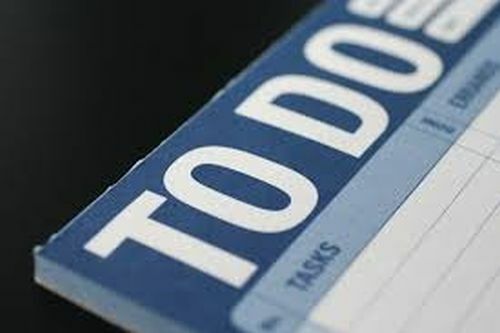 Fifth, throw away all your prior lists and do the one thing you can have control over; make a to-do list for yourself. -Stay connected with your adult children no matter what. -Make plenty of time for your grandchildren. -Thank God every day for character-building lessons. -If you desire covenant-keeping children, keep your own covenants. -Above all, don’t lose hope. Life is long, checklists change, God is patient, and your children were His children first. I love you. And Donna. Thank you for sharing this. So valuable! Where can I send you a personal email? I identify with this message a great deal. You nailed it! After far too many tears, I finally moved on to working much harder on loving and showing that love to my children. Moving on to my own check list, instead of having the “mommy checklist” take center stage, helped me have a more balanced life and reach my lifelong goal of finishing my bachelor’s degree last year (I left school when I was pregnant with baby #1). Even so, I appreciate all these reminders, Daryl. Thanks again for another fabulous article. Bonnie, I wish we could sit and talk in person like the old days! Sounds like you have lots of wisdom to share. This is a great article. I would add to not love and serve the person with the hope that they return to your religious beliefs. Love them because of the wonderful person that already are. They are already whole and complete, they aren’t missing pieces of their soul. Just love them with no expectations, and no strings attached! Kelly, I wrote it for me, but if you want to own it, too, I’m glad it helps.